I promise you that when I left work tonight I had no idea what I was going to make for dinner. And that’s not like me. Typically, I plan all our meals for the week and shop on Saturday and from these formidable planning skills seven meals appear effortlessly and right on time throughout the week. And as long as we’re making things up, Heidi Klum should play me in the Kate Cooks the Books movie. The part about planning all the meals and going to the store on Saturday is true anyway. But this week, having returned late Sunday afternoon from being away for Thanksgiving weekend I did not have time for my normal careful planning and preparation. I could have stopped for something on the way home but I felt up for a challenge. After all, we had food in the house. And what always comes to the rescue in situations like these? Eggs! 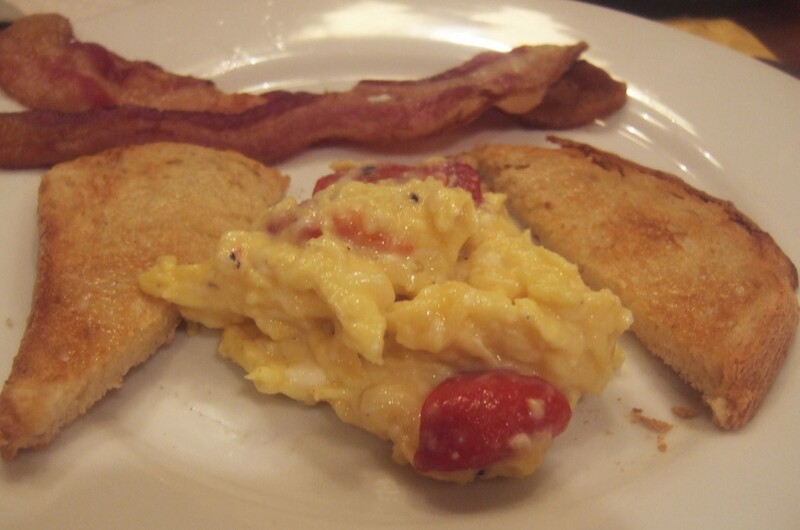 I made this recipe up by combining a good scrambled egg technique and things I often have on hand including cheese and roasted red peppers (a miracle in a jar). I had bacon left over from making the White Bean Soup with Rosemary Croutons (I like to bake my bacon in a 400-degree oven. This method is appealing in that you don’t have to think about it for 10 or 15 minutes while you make other things and it makes perfectly cooked bacon every time) so I served that on the side, and toast (insert bread into toaster. Toast. Butter. Serve immediately). Think of it as culinary improv. If I do say so myself, these eggs are heavenly. Creamy and rich and just cheesy enough. The red pepper add some nice color and a little tang. And as I’m sure you’ve guessed, the whole meal comes together in 15 minutes. Place eggs, cream, milk, salt and pepper in a bowl and whisk to combine. Heat butter in a 12″ non-stick skillet over medium heat. When foaming subsides, add eggs. Stir constantly and slowly, gently folding eggs over until large curds form but eggs are still very moist (2-3 minutes). Off heat, add peppers and gruyere and fold to combine. Serve immediately. Speaking of eggs. Bittman has a lot of quick recipes using eggs in a book I just received today. Kitchen Espress – $10 on sale @ Amazon. 404 seasonal blurbs really of ideas for quick meals. I am enjoying it. Not many measurements, just ingredients. Sounds interesting Kathy, I will check it out. Thanks! I absolutely love eggs – just about in any form. And B for D, as we call it here, is always a welcome treat, and these look perfect. Is there a particular brand of roasted peppers in a jar that you prefer? A couple of questions: First, do you make Dutch Babies? Next, do you (1) have a waffle iron and (2) make Marion Cunningham’s raised waffles? I use a Belgian waffle iron to make them. Kim Severson, a writer for The NYTimes in her recent book said to use a regular waffler (is that a word? ), but I have made them both ways and disagree. When I serve them, I don’t add any extra butter, but I do sort of slather them in hot maple syrup (but I’m spoiled in this regard because the syrup is from our own maple trees upstate). These are both delicious treats, and the resident vegetarian can eat them. No, no particular red peppers for me. I like them all. No, never made Dutch Babies, but I think I know what they are. Do you have a recipe? Yes, I have a Belgian waffle iron. I have not made the Marion Cunningham waffles but I have made Rose Levy Birnbaum’s and the Cook’s Illustrated Yeasted Waffles. Love love love all of them. In fact when one of my assistants left I brough in batter and my waffle iron and made waffles for the whole team in honor of her last day. People just about died from the glorious smell of waffles cooking. You have your own maple syrup?!?!?!?! Color me JEALOUS! Actually, it would not be a good thing for me to have that kind of access to culinary crack. Made these eggs for breakfast today. Absolutely great. I really think that eggs for dinner are under valued & under used. Great nutrition, fast & inexpensive.